What makes the perfect muffin? I think it has to be sweet, but not overly sweet, and it has to compliment savory dishes served at brunch. Chocolate Covered Pear Muffins are the perfect fit for your next breakfast or brunch gathering. I created a sweet, but not too sweet muffin you can serve year round to celebrate the newest feature Ancestry is offering, Traits, a new feature that can be added your Ancestry account! Thanks to Ancestry for sponsoring this post. Last year, I took an AncestryDNA test and I have to say it was an eye-opening experience. It was amazing to take a deeper look at my heritage and fun to connect with people who share similar DNA results. I’ve always been interested in my family history and have felt a deep connection with my Japanese ancestors. After I received my DNA kit results from Ancestry, I was surprised to see how many different nationalities were represented in my family history. Have you ever wondered why you like certain tastes and smells more than others? Hint: it’s partly in our DNA. WHAT? It’s true. And now, AncestryDNA is offering a new feature called Traits, which includes 18 traits to help you discover more about your family story. Ancestry uses your DNA to look into 5 sensory traits (and 13 appearance traits) for instance, your bitter, sweet or savory taste perception, or if you have an aversion to cilantro. You can also compare your genetic markers with friends and family members. From Black Friday thru Cyber Monday, you can buy the AncestryDNA kit for only $49 (with an additional $10 for the Traits feature). Existing customers can purchase the Traits feature separately through their Ancestry.com account. Can you say Christmas shopping DONE?! It’s the perfect holiday gift for your special someone who has everything. I was curious to find out more about my sensory traits and how they connected me to my ancestors. My Japanese ancestors didn’t consume a lot of “sweet” treats it’s just not a part of the Japanese diet. My mom, for example, immediately scrapes the frosting off of a cupcake or cookie as soon as it is served to her! I often do the same. We love a good sweet fix, but only to a certain degree. This is exactly what my Traits findings showed. A sweet sensitivity. 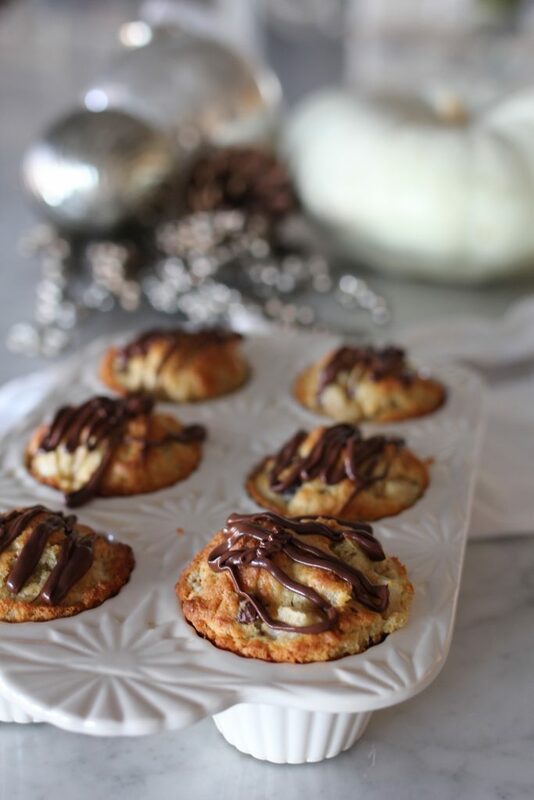 Chocolate Covered Pear Muffins are the best of both world’s- sweet enough to enjoy for a dessert and not too sweet for breakfast or a brunch buffet. I’m planning to make these over the holidays for gatherings. They can easily be made ahead and frozen until ready to serve (instructions on notes in recipe). I know you’ll love learning about your traits with AncestryDNA Traits. If you want to learn more about the special traits you’ve inherited from your ancestors, this special is just for you. There’s nothing more rewarding than learning where you come from and what makes you who you are! Not too sweet, this Chocoalte Covered Pear Muffins are the utlimate muffin or dessert! 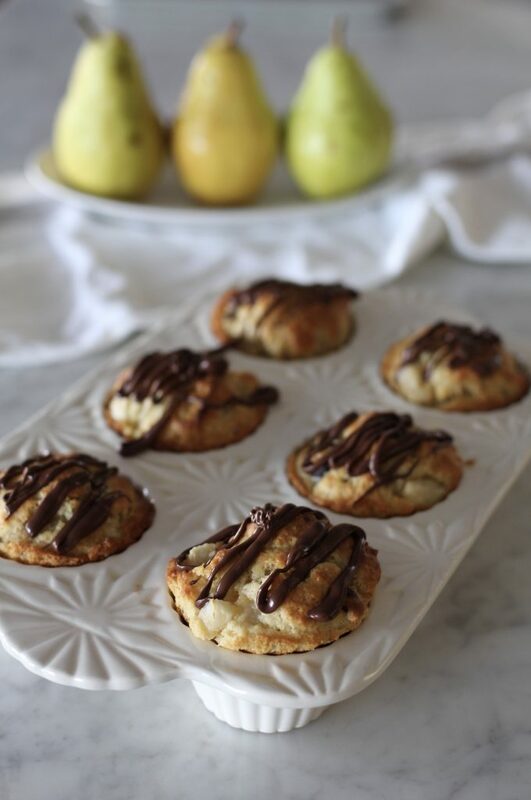 Fresh pears and chocolate inside of a muffin an dtopped with a bit of dark chocolate drizzle. Place rack in middle of oven and preheat oven to 425 degrees. Cream butter and brown sugar together in a large bowl or stand mixer. Scrape down sides of mixer and turn on again until butter and sugar are mixed together. A few small lumps are okay. Add Greek yogurt (or sour cream) and eggs and beat for about 30 seconds to one minute on medium speed. Turn off mixer. Add all dry ingredients, including 1/2 (not 1/2 cup!) of the chocolate chips. Mix on low just until the flour disappears using a pulsing, or a quick on and off motion with the mixer. Fold in chopped pears. Scoop into a well greased muffin tin, fill about 3/4 full. The batter will be very thick, similar to a cookie dough. Bake for about 12-15 minutes or until muffins are set and tops are golden. Baking time will vary depending on size of muffin tin. Do not over bake! Remove from oven and let cool completely. 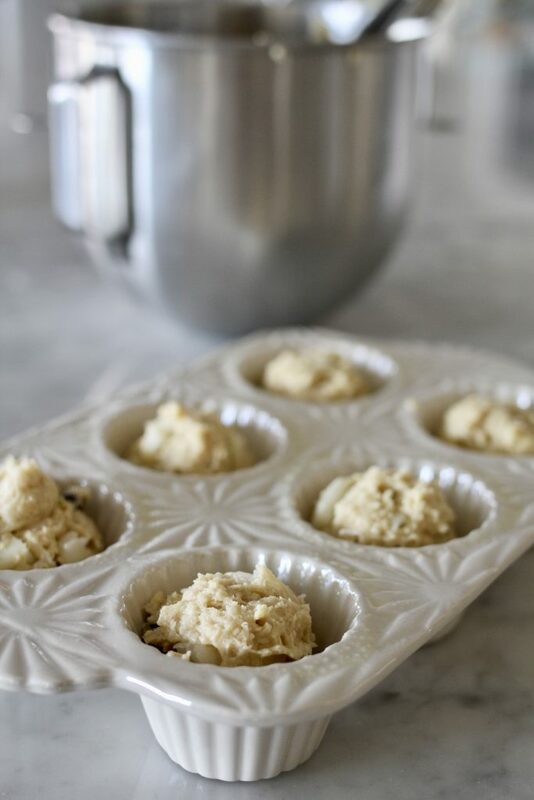 You may remove from muffin tin after about 5 minutes and place on cooling rack to speed up cooling process. When muffins are cooled, place remaining chocolate chips in a sandwich size ziplock bag and seal. Microwave for 20-25 seconds at a time, squishing down the chocolate chips in the bag until melted. This usually takes less than a minute total. 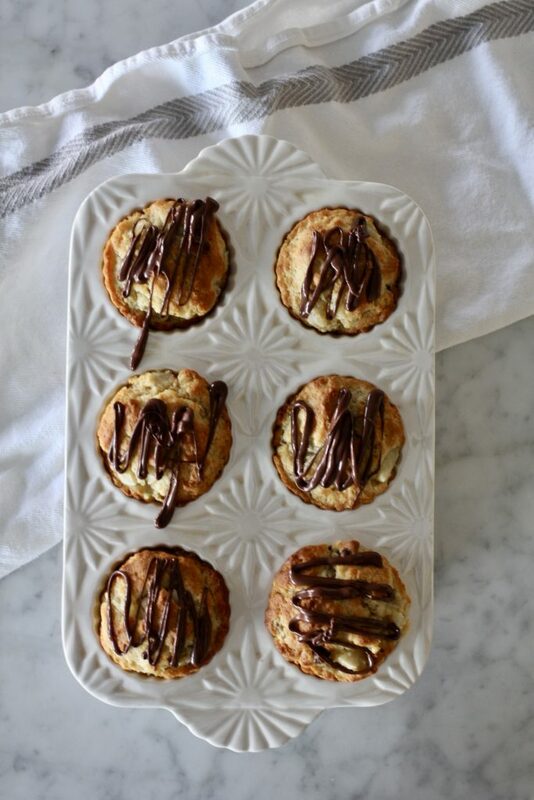 When the chips are melted, snip off a small corner of the bag and drizzle chocolate onto muffin tops. Do not over mix muffins. 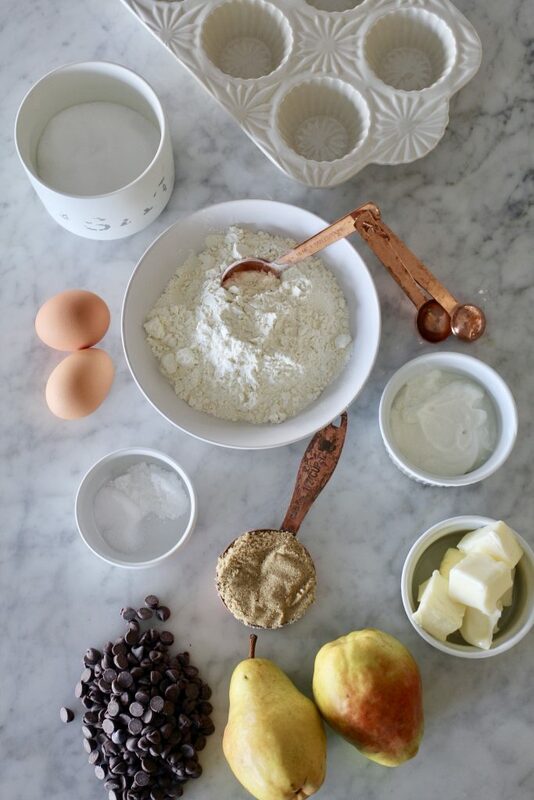 Keep the speed of the mixer on low after adding the dry ingredients to the recipe. You may also use canned pears, drained and chopped for this recipe. Dipping chocolate or candy melts sold at cake decorating stores may also be used and melted for the topping. For mini muffins, follow same directions and bake for 7-10 minutes. If making ahead and freezing, let cool completely and place muffins in a ziplock bag in a single layer. When ready to serve, let thaw and drizzle on chocolate topping.